The Quantum Kevin VanDam Signature Series Baitcaster Reel was made for the highest-performing bass angler on the planet, in three separate gear ratios to fit every possible fishing situation. Built on a sleek low-profile frame, Quantum’s Kevin VanDam Signature Series Reel has 10 stainless steel bearings including a strong, zero-play Continuous Anti-Reverse roller bearing for eye-crossing hooksets. The exclusive ACS cast control system offers precise adjustability via an external dial, so you can adapt quickly to the most demanding conditions--no need to fiddle with sidecovers and weights. "I got 2 of these reels for Christmas.Reels would not cast,grinded on retrieve.All around a big disappointment.Took them back to my local Bass Pro & got 2 Extreme reels that work better & cost less!!!!" "I have only had te chance to fish with the KVD for two days now, because i bought it two days ago.. i will say that so far i am pleased... I fish around five days a week and i need a reel that will last..."
"I am new to baitcasters and had tried a few of my dad's reels. I tried a couple of others and they felt cheap and poorly made. 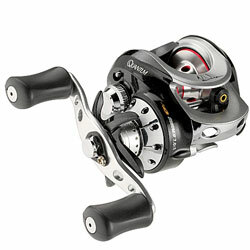 This KVD reel feels good in the hand with its contours and chrome finish."